I'm not gonna lie, I have always been a fan of crystals. I love them around the house, in jewellery, and I think I especially love them as part of a lovely wedding theme! Amethyst and other crystals are a big trend in 2018, and are a big YES in my book. There are so many ways to bring a bit of amethyst goodness into your wedding design, whether it's using dusty lilac hues for your bridesmaids dresses, or using the actual crystals as part of your table decor. If you are an amethyst fan like I am, I've put together some ideas for how you can incorporate this trend into your own wedding. Bridesmaids dresses can be a great way to incorporate your wedding colours into the day, especially if you go for a few different shades so it's not too overwhelming. I love the gorgeous amethyst inspired tones in these bridesmaids dresses, paired with the floaty fabric - total winners. Cocktails are always fun (obvs) but they are extra fun if you tie them into your wedding theme. Why not give your cocktails appropriate names? Bonus points that it makes them sound extra fancy. Your guests remember little details like that, and it really helps to bring the whole wedding together cohesively. If you'd like details like this geode shaped cocktail menu made for your wedding, you might want to have a look at my styling services - I can design something similar for you! I am OBSESSED with geode cakes! 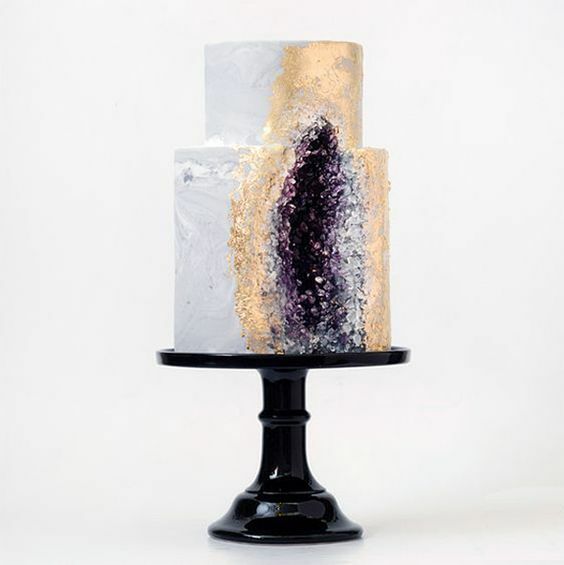 Clever cake makers are turning crystallised sugar into these works of art, and not only are they beautiful and modern looking, they would be perfect for an amethyst themed wedding. 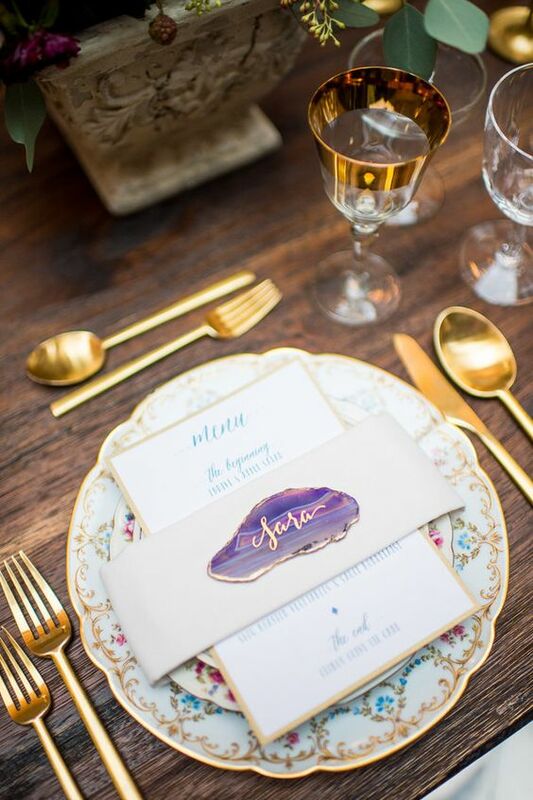 I especially love this design with the edible gold detailing, too perfect to eat right?? Your tablescape is the best place to bring your theme to life at a wedding in some ways, because it's often where your guests will be spending a good portion of the day sitting on one place where they can really soak up the atmosphere you've made for them. Bring in those dusty purple hues again, and you can even add real crystal details like geode place cards to finish it all off. 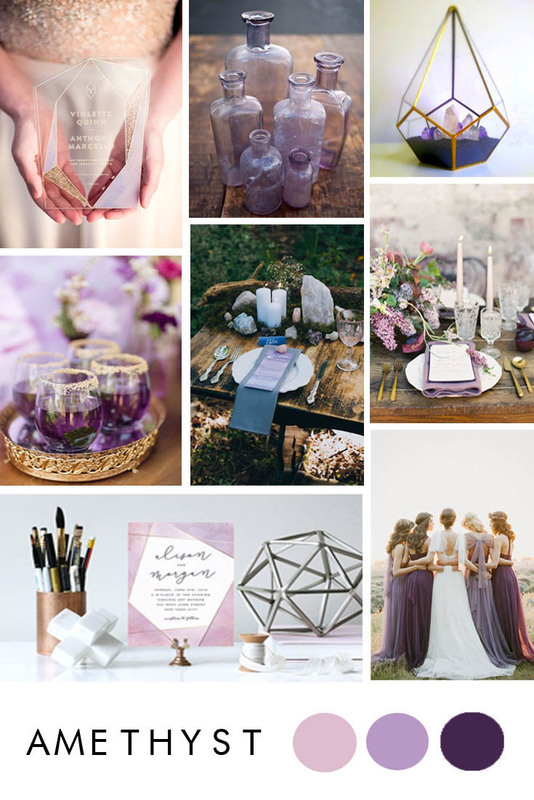 What are your thoughts on an amethyst wedding theme? Are you convinced?